Granada is famous for its tapas bars, not only for its quality but because they offer it free with your beer. Second beer comes with another different tapa. Many times you will hear the waiter ask “your beer number?”. It is very normal to go moving from bar to bar sampling the specialties of each. Besides, it is very affordable, you can have lunch or dinner with three beers (or soda or water, depending on your tastes and your alcohol tolerance) for 3-4 €. Here you can find the largest variety of tapas bars throughout Granada. Bars with a tradition of over 30 years to modern bars cuisine. Area Navas Street is the most typical tapas, is right next to the City of Granada. The most popular bars are Diamonds, The Braserito or La Tana. EL Realejo has very traditional bars, and there you can not go wrong visiting El Molino or Candela Bar, there are also more modern as it is Jergón with vegetarian tapas. In the center of Realejo you can find the Campo del Principe, and as we live not only eating tapas you can enjoy Granada traditional dishes, in the Tavern Tofe, Los ALtramuces and Las Niñas. Around the Faculties of Sciences and the Law, you will find tapas bars for students, with more generous tapas. There you can find the Agamemnon Brewery Tavern El Vinillo or Diners Tapeo del Pillín at street Pedro Antonio de Alarcón, and in the San Juan de Dios area, you can visit El Labrador y El Establo, and finally do not miss the El Garden or El Pesaor in Gonzalo Gallas. Bars here are even cheaper than the rest covers as its clientele is young people are over budget. If you want higher quality and originality, yours are the gastrobares. Here you will find dishes cuisine and original dishes with lids. Notably Saffron, Borage or La Criolla. If you want international tapas should visit La Bella Kurva and Bamboo, where you can sample tapas-inspired dishes from many countries. Granada is very close to the coast, so do not miss a lot of fish tapas bars. If you want to try approach the plaza area of Gracia where you can find places like El Puesto 43 – Miguel Cunini, De Costa a Costa or El Rincón de Rodri. One of the areas most traditional tapas bars in Granada. This neighborhood, famous for its white house charm, its slopes (prepares your legs) and their views of the Alhambra, has several places where you can ask a good rest and fresh beer with the tapa. The best known are the long square Plaza, Plaza San Miguel Bajo or Aliatar Square. The Albaicin is one of the oldest neighborhoods in Granada, where you can enjoy firsthand the tradition of flamenco (there are several flamenco clubs) and has balconies on the Alhambra, like San Antonio. The tops are the most typical Albaicin paella or crumbs. But if you want to get away from the typical get close to Bar Reina Monica, where they offer a variety of dishes and you can choose between three different varieties in each drink. Not only bars in Albaicín squares, wondering you can find el Casa Torcuato, Los Mascarones, Los Caracoles, El Ladrillo, El Pañero or La Porrona. 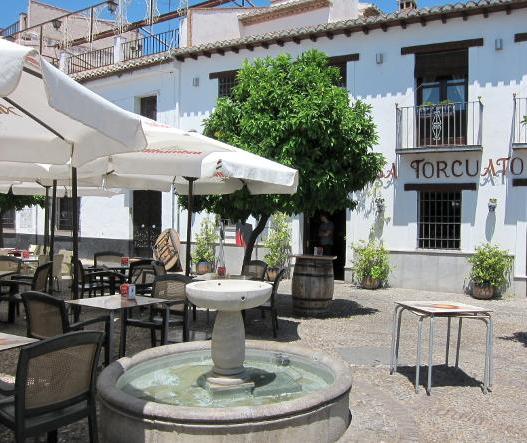 If you want quality and abundant tapas, you have to go to the bars around the Bull ring. 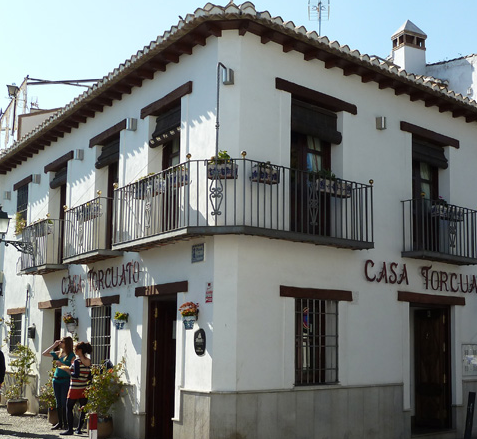 This tapas bars frequented by students and young people who primarily seek abundant tapas. Our highlight bar, La Ballena alegre, Brasilia, El Nido del Buho or Los Pescadores. One of the most desirable neighborhoods for tapas. In the nearby bars Zaidín lifetime with more modern, abundant tapas and good quality. What’s Near the Palace of Sports and the New Stadium called los Carmenes you can sit and enjoy the outdoor terrace bars. The most famous is The Ecu but do not miss el Museo de la tapa or El Retranqueo. The Chana is one of the most popular neighborhoods go to tapas. It has low prices, abundant tapas tapas and lots of variety to choose from. In Las Torres you will find the largest number of bars, including the Bar Teruel, La locura del rey or El Güejareño. El Arenal is one of the most famous bars in the Chana for their more than generous tapas. Is farther from the concentration of tapas bars, but if you are someone who repeat, you can be satisfied here.